Like the fabled ‘Kruger Millions’ – the treasure which Transvaal republic president Paul Kruger was supposed to have buried or stashed away before fleeing to Switzerland during the Anglo-Boer War – the tales of the Gaddafi Trillions just won’t go away. There were several newspapers stories about the treasure in 2013, but last weekend the Johannesburg Sunday Independent gave the most comprehensive account of the vast quantities of loot which were allegedly flown from Libya to South Africa during the last days of the regime of former Libyan leader Muammar Gaddafi. Unlike Kruger, of course, Gaddafi never got away. He was caught as he tried to flee from his home town of Sirte towards the border on 20 October 2011 and murdered in cold blood. The Sunday Independent reported that some R2 trillion in US dollars, hundreds of tons of gold and six million carats of diamonds, were ferried to South Africa in at least 62 flights between Tripoli and South Africa. The loot is now being stored at seven heavily guarded warehouses and bunkers in secret locations between Pretoria and Johannesburg. The newspaper said that the Hawks – South Africa’s special investigative unit – were investigating a possible violation of exchange control regulations relating to this clandestine import of cash and treasure. The R2 trillion excluded several billion rands held legally in four banks in South Africa, the Sunday Independent also said. Fantastical as it sounds, the story does not lack credibility. First of all, it was written by the Sunday Independent’s editor Jovial Rantao who said it was based on official documentation he had seen. Secondly, Western diplomats do not discount the report. And thirdly, the South African authorities have not dismissed the report as a fairy tale, as they presumably could have. Instead the Hawks simply declined to comment. ‘We are at a level where we cannot comment on the matter,’ spokesman Captain Paul Ramaloko told the South African Press Association, rather intriguingly. Even more intriguing is the hint at President Jacob Zuma’s involvement in the flight of the Gaddafi Trillions to South Africa. The Sunday Independent story suggested that most of the assets were moved after Zuma became involved in an African Union (AU) effort to end the civil war between Gaddafi and the Benghazi-based rebels trying to oust him. Zuma flew to Tripoli in April 2011 with a five-person African presidential committee appointed by the AU to mediate between the two sides. On 10 April, after the committee had met Gaddafi, Zuma announced that Gaddafi had accepted the AU roadmap for ending the conflict. Zuma himself did not fly on to Benghazi to meet the rebel leaders but the other members of the AU presidential committee did. The rebels rejected the roadmap and it eventually came to nothing. NATO had temporarily lifted its no-fly zone over Libya to allow Zuma and the rest of the committee into the country on their peace mission. There were to be many recriminations by Zuma, the AU and others later that NATO deliberately sabotaged their peace efforts by not suspending the blockade again so they could continue their efforts. Their criticism of NATO has been reinforced by the chaos into which Libya has fallen since the fall of Gaddafi and the overflow of its instability into neighbouring countries. Critics of NATO, including the South African government, say that the power-sharing formula that lay behind the AU roadmap, could have avoided this chaos. The re-appearance of the Gaddafi treasure, if it indeed exists, raises some interesting questions about that peace process. 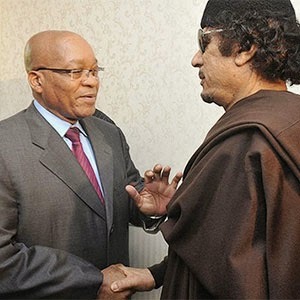 Did Zuma make a deal with Gaddafi to safeguard the loot, when he met him in Tripoli on the peace mission? And if so, to what end? Was the idea to make the money available to him if indeed he lost the battle but managed to flee the country? When the rebels captured Tripoli that August and Gaddafi disappeared, there were many rumours that he had headed for South Africa. Instead he had just retreated to his tribal base in Sirte, perhaps intending a comeback, or perhaps just waiting for the coast to clear before making his fatal run south, apparently to the border. And if this was the deal with the loot, was there to be a big commission for those who took care of it? It was never a secret that Gaddafi dispensed the proceeds of Libya’s oil wealth liberally to his allies. There have been persistent rumours that the ANC was one of his beneficiaries, along with many other African governments and rebel movements. That fact deeply undercut the credibility of that AU peace effort in 2011, suggesting to many that it was designed to save Gaddafi rather than to save Libya. When the reports about the Gaddafi Trillions first surfaced last year, it was said that two factions in the ANC government were fighting over the treasure and each was dealing with a different faction in Libya. The Sunday Independent story reiterates and elaborates on part of this narrative, naming two international independent agencies supposedly trying to get their hands on the loot, each claiming to be the authentic representative of the Libyan government. One of them, at least, promises that if it gets hold of the assets, it will re-invest them liberally in South Africa. Quite clearly all such claims should be treated as bogus. Libya is now run, if that is the right word, by two governments, one Islamist and the other secular, each controlling different territories. At this stage, in effect, there is no legitimate government to which any such assets could ethically be returned. Shortly after the reports about the Gaddafi loot surfaced last year, then finance minister Pravin Gordhan met the minister in the office of the Libyan prime minister, Usama al Abid in Pretoria. They issued a statement to say they had agreed that Libyan funds in South Africa would be repatriated through the UN, which had established a committee and panel of experts to seek Gaddafi’s assets around the world. But Gordhan and al Abidi appeared to be referring to legitimate and transparent assets, like those referred to in the Sunday Independent story as being held in South African bank accounts and investments, such as in a Joburg hotel group. Since then Libya has descended into further chaos and who knows where al Abidi is? Clearly all assets which Gaddafi invested – or secretly stashed – in South Africa belong to the Libyan people and should be frozen and held in trust until a comprehensive and stable government is in place. And that includes the Gaddafi Trillions, if indeed they exist. The reports should be taken seriously enough for the government to launch a transparent, independent and credible investigation into the existence of the assets, who brought them into the country, and for what purpose. The only legitimate explanation for doing so would have been to keep them secure for the Libyan people and for this purpose, surely no secrecy is required?